Saint Francis Borgia, named for Francis of Assisi at his birth in 1510, was placed under the tutelage of his uncle, Archbishop of Saragossa, after the death of his mother when he was ten years old. Soon he had to go to the court of Spain, as he was destined to be one of the great lords of that nation. There he remained Christian, modest and virtuous. His noble and beautiful appearance soon brought upon him snares which he succeeded in escaping, setting for himself regimes of prayer and study to escape from the dangers. He wore a hair shirt, and never would enter into any of those games of chance which cause the loss not only of money but of time, the spirit of devotion, and peace of soul. The Empress arranged for him to marry Eleanor de Castro of Portugal, who like himself was very pious. They were blessed with eight children, five sons and three daughters, who continued to practice the virtue of their parents. Having become the Duke of Gandia after his father's death, he became one of the richest and most honored nobles in Spain. In 1539, there was laid upon him the sad duty of escorting the mortal remains of his once beautiful sovereign, the Empress Isabella, who had died still young, to the royal burial ground at Granada. The coffin had to be opened for him, that he might verify the body before it was placed in the tomb; and so unrecognizable, so astonishing a sight met his eyes that he vowed never again to serve any earthly sovereign, subject to so drastic and terrible a change. It was many years before he could follow the call of his Lord; the emperor named him Captain-General of Catalonia, and sent him to bring to justice a group of bandits who had ravaged the countryside. The poor found in him strong protection against oppression. Vices were banished by his ordinances; he endowed poor girls and assisted families ruined by misery and reversals; he delivered debtors from prisons by paying what they owed. He was in effect the very Christian Viceroy of the Emperor. Saint Francis was relieved of this duty when he asked the Emperor, after the death of his father, to return and govern his subjects at Gandia. In Gandia he again did much public good; he built monasteries, founded hospitals, helped the poor in every possible way. But suddenly, his wife was taken from him. He was told by God that this loss was for both his and her own advantage, and amid his tears he offered his own life and that of his children, if that would please the Eternal Master. After making a retreat according to the Exercises of Saint Ignatius, under Blessed Peter Favre, he made the vows of a Jesuit privately until he could see to the establishment of his children. When he went to Rome with one of them, it was rumored he would be made a cardinal like two of his brothers. But he wished to avoid all dignities, and succeeded in doing so by leaving Rome as soon as possible. Saint Ignatius made him his Vicar General for Spain, Portugal, and the East Indies, and there was scarcely a city of Spain and Portugal where he did not establish colleges or houses of the Company of Jesus. 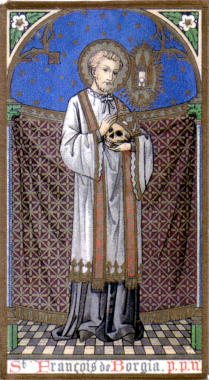 At the death of Saint Ignatius two years later, the Order chose him to be its General. Then his journeys became countless; to narrate them all would be an impossibility. The Turks were threatening Christendom, and Pope Saint Pius V commissioned two cardinal-legates to go and assemble the European Christian princes into a league for its defense. The holy Pope chose Francis to accompany one of the Cardinals and, worn out as he was, the Saint obeyed at once. The fatigues of the embassy exhausted what little life was left to him. Saint Francis died in the same year as Saint Pius V, happy to do so in the service of God and the Church, when he returned to Rome in October, 1572. Reflection: Francis Borgia learned the value of earthly grandeurs at the funeral of Queen Isabella. Do the deaths of friends teach us anything about what awaits us also?